Fluffy sweet Fairy Floss that melts in your mouth always adds that extra spark to your special event. Our Fairy Floss machines are easy to operate and come with all equipment needed to serve your guests. Hire Fully Operated or DIY (Do It Yourself). You are supplied with a fairy floss machine, sticks ,fairy floss mix and a choice of 3 flavours. 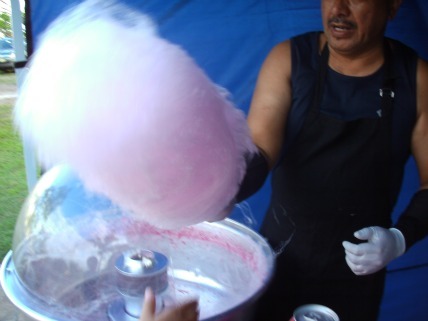 One of our experienced staff will demonstrate how to operate the fairy floss machine. Machine Pick-up is available in Tanah Merah or delivery is available at additional cost if preferred. All DIY prices are for 24 hour hire period. Sit back, relax and enjoy yourself. Let us do all the work for you. You will be supplied with the fairy floss machine ,sticks ,fairy floss mix and a choice of 3 flavours. 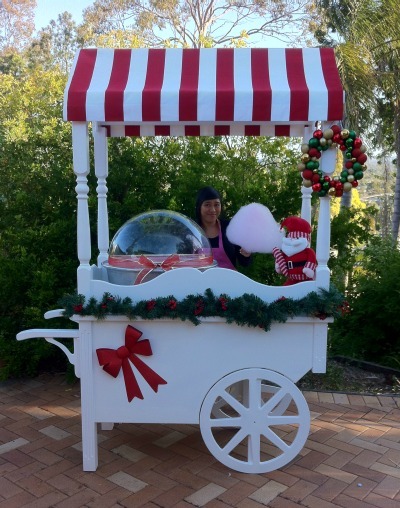 One of our friendly experienced staff will deliver, setup and serve your guests fluffy sweet fairy floss. We can cater for any event large or small and why not add a Snow Cone machine or Popcorn machine to your celebration a perfect combination for any occasion. Our vintage cart with fairyfloss machine. Themed for Christmas.